This is too silly, Too Wild and way Too DUMB. It takes what the orignal did perfectly and blew it way out of proportion. I was very excited for any crazy thing to come on screen, but I was very disappointed. One of the best sequels out there. It's funny, charming, and entertaining. This movie is so awesome it's off the awesome meter! And one of the funniest, cleverest movies of all time, too! Gremlins 2 is a great sequel that takes the franchise in a completely different direction. Gremlins 1 is more of a horror comedy and this movie is straight up looney tunes comedy and i love it. I prefer the sequel to the original. Don't judge me! 1/5. Gremlins 2 is the single most obnoxious movie I have ever seen. It has great practical effects and I love Gizmo, but the rest of this movie is a nightmare to sit through. This movie wasn't as good as it's predecessor, but still had a pretty good story, a good amount of scares and kept the same classic characters we're all used to. "Gremlins 2: The New Batch" Is not a horror, it's a comedy. It's purposely goofy, and it works. But it still keeps a solid plot. Gizmo actually not in much of it. There's a electric Gremlin, a spider Gremlin , a bat Gremlin, a plant Gremlin, a kid-like Gremlin, a "lady" Gremlin, the bran gremlin, and many more. As you can it's over the top fun! 7/10 Incredibly stupid but still plenty of fun, Gremlins 2 is a love-it-or-hate-it horror comedy that should satisfy those looking for an easy diversion. Anyone looking for a continuation of the first movie's tones and themes will be sorely disappointed, which was kind of the point of the film. Sequels are a poor idea unless the first film could have been successfully expanded upon, not dragged out. This film is a representation of the ridiculous notion that is the modern sequel, as it can never truly pull you into the story unless it's a direct continuation or at the very least very consistent. But this movie makes a point in not being consistent, in fact its a marvel of organized chaos. It is fitting that the film opens with the fourth wall breaking bugs bunny and Daffy Duck, in fact it is a perfect opening for it. It introduces the tone so early on as if to suspend your idea this will be a traditional sequel, a proverbial, "Beware all yee who enter here", if you will. While it is a different tone it is still faithful to the absolute chaotic nature of it's namesake, i'd argue even more so than the original. While in the first movie its a comedic horror flick that set up an entire Spielberg-esque film for the gremlins to hijack, The New Batch allows them to simply take over the movie itself both literally midway into the movie and figuratively through the monolithic and entirely corporate Clamp Tower. It is a pure romp in ways of comedy and the art of film making itself, satirizing the disingenuous nature of the film industry. As I said, anyone looking for direct sequel will be sorely disappointed, because that's not what this movie was made to be. This is a horrible sequel to a great movie. 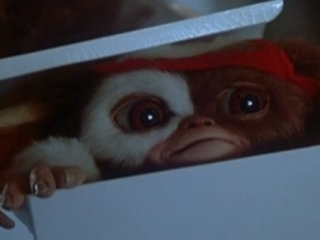 Whereas Gremlins gets better after every watch this gets worse. Not sure what anyone making this movie was thinking. All puppets, no plot, but who doesn't love a Joe Dante flick? Gremlins 2: The New Batch is so messy, loud, and unfocused but it is also designed to be more of a B movie than its predecessor, which I think caters to the midnight movie crowd. Is it a perfect sequel, hell no, but that may have been the point, and while I am somewhat relieved we never got a Gremlins 3, for a time-killer, the film is entraining, plus Phoebe Cates and Christopher Lee... need I say more? Also, this is post Die Hard, so the entire thing takes place in a professional building, in other words, it's Gremlins meets Die Hard... Awesome! Lots of over-the-top, mischevious fun! One of the worst sequels (and worst movies) ever made. This movie somehow has a 67% RT score? And movies like Mr. Wrong, which at least has some funny scenes, has a single-digit score. Leonard Maltin didn't like the first Gremlins, which is his right. But when they cast him in this turd and gave him a cameo, he gave this movie a BETTER review than the first. 3 out of 4 stars? No way. This movie has no plot, no point, and some of the oddest, most random creature-creations by Rick Baker imaginable. There is no reason these creatures are so wildly diverse and varied compared to the first movie. It's as if Joe Dante and gang didn't bother to explain WHY the creatures look like bats, spiders, slow-witted rednecks and others wear glasses and talk. Bizarre. Characters WHO DIED in Gremlins are back for this "sequel." A $50 million budget + unlimited creative control resulted in this piece of garbage. The studio deserved to lose 10 million at the box office. SO bad. A bit over the top and too silly for my taste. While I wasn't a fan of it either, I think the first one is decent and part 2 was not needed. Closer to a live action Looney Tunes film than the horror comedy people were expecting, this is anarchic satire at its best. The primary target of its satirical bent is (surprisingly) the original Gremlins, but Donald Trump and Ted Turner are also frequently skewered. This is the perfect full stop to '80s corporatist America, openly mocking the trend of unnecessary sequels and the greed at the heart of the decade. Many people will be put off by the meta-textual elements, but if you want to see a filmmaker completely cut loose and gleefully bite the hand that feeds him, this is the movie for you.